David Harvey was at the University of Illinois, Urbana-Champaign yesterday to give the Illinois Program for Research in the Humanities “Revolution” Theme Lecture. The people who live in the cities, their lives, and how they set about changing the city to accommodate their own wants and needs. Harvey connects the perpetual growth of capitalism to urbanization, positioning financial crisis as a crisis of urbanization. He articulates the city and urban landscape as a political and social project, one that has historically been used as a key site of generating capital accumulation. Harvey notes that while capital surplus has historically been re-invested in urbanization and the building of cities, this is not currently happening in the United States post the 2008 financial crisis. Instead there is a fear of investment and an emphasis on the classic economic model of bolstering production and factories as a means to generate capital. Harvey argues that this model is flawed and that land, rent, and speculation are the true drivers of capitalism. Harvey provides numerous historical examples to support his argument. As a more recent illustration of these points, he discusses how China has dealt with the global financial crisis by heavily investing in the building of new cities creating some 30 million jobs in a 9 month period. For Harvey, the significance of identifying the city as a key driver of capitalism is the potential to disrupt this system in favor of a system that values humanity over exchange. How might the city be organized as a political and social project that works for the 99% rather than the 1% (as it currently stands)? What would a re-imagining of the city require? These provocations are powerful and require an examination of deeply entrenched societal values. For anyone interested in going deeper with Harvey’s work around city spaces, I recommend his book that the lecture was largely based from, Rebel Cities: From the Right to the City to the Urban Revolution. 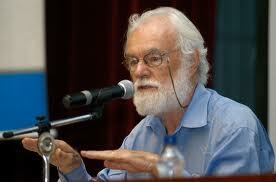 Listen to David Harvey interviewed on Focus 580 by Craig Cohen on WILL AM 580. Note: This post first blogged on my HASTAC scholars site.